…that is, if you choose to do so at Da Aurelio! The restaurant is a 30-minute drive from Cortina d’Ampezzo, not far from Badia, Alleghe, Agordo and Longarone. 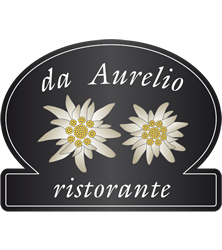 Opened in 1970 by Aurelio Dariz, the restaurant is now run by his son, Gigi. A Gourmet Paradise, Da Aurelio offers sought after dishes that one can enjoy either in a warm and welcoming dining room, or on the terrace with breathtaking panoramic views of the Averau, the massive Sella, and the Marmolada. The restaurant is delighted with their positive reviews from various international guides, including Identità Golose. Their loyal customers confirm their success.